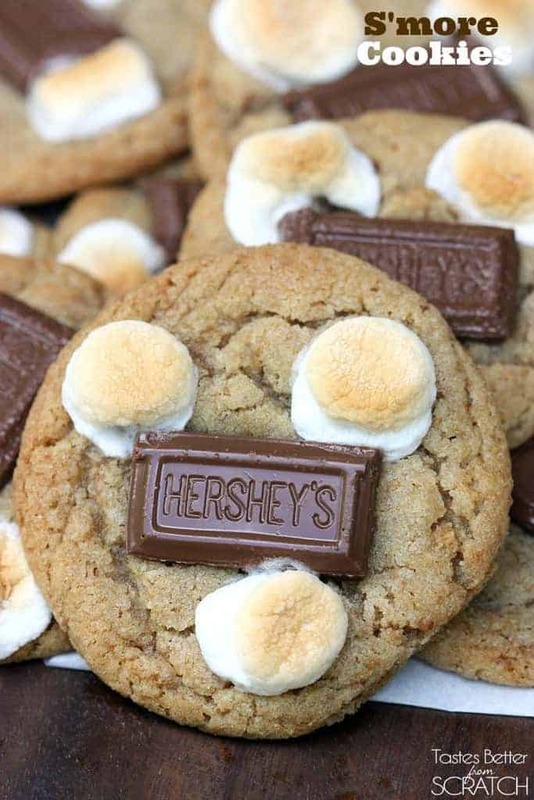 S’more Cookies are soft and chewy graham cracker cookies topped with mini marshmallows and chocolate. I LOVE baking on the weekends. It really depends on how big my sweet tooth is at the time, but my go-to is usually cookies. Since it’s summertime and all, I have been completely craving S’mores!!! These S’more Cookies did more than hit the spot. They are seriously, dangerously addicting. The base of the S’more Cookies is the most delicious, soft and chewy graham cracker cookie. Then I topped them with some chocolate and marshmallows. Stick them under the broiler for a minute or two and it toasts the mallows just perfectly! The result is a soft, chewy, gooey, s’more cookie that is –dare I say it– even better than the traditional! Seriously people, these are GOOOOOOD. 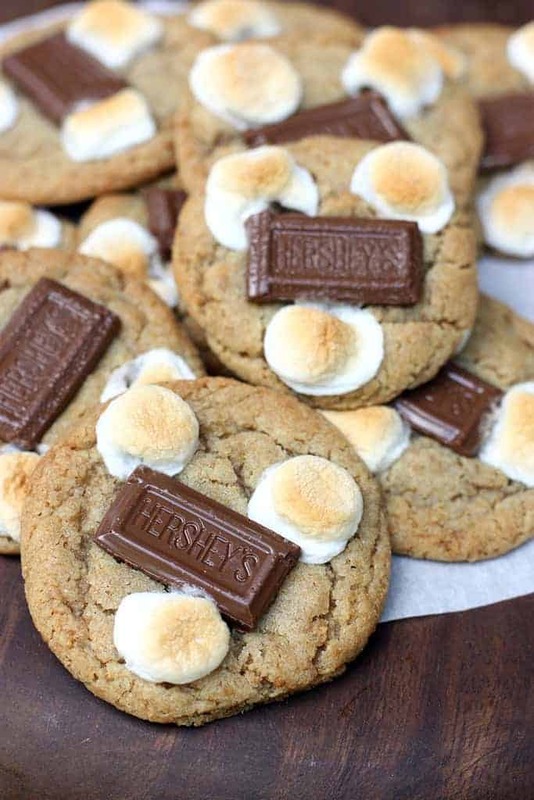 S'more Cookies are soft and chewy graham cracker cookies topped with mini marshmallows and chocolate. In large mixing bowl cream together the butter, granulated sugar and brown sugar. Add flour, graham cracker crumbs, baking soda and salt and mix until combined. Roll dough into about 24 balls and place on a parchment lined cookie sheet, a few inches apart. Bake for about 8 minutes. Remove from oven and turn oven to a high broil. Press a piece of chocolate and a few marshmallows onto the top of each cookie. Return to oven and broil on high for 1-2 minutes, until marshmallows are golden brown. Remove to a wire rack to cool completely. PS. Your picture made me salivate – great job! Thanks so much 🙂 Yes I love that you still get the s’mores taste without the mess! Thanks Erica! Hope you get a chance to try them! Ohhh my goodness, these look good. I’ve been super-craving smores lately, and this definitely doesn’t help! I’m so sad that I don’t have any marshmallows! :'(! Thanks Farrah. There’s just something about summertime and s’mores! 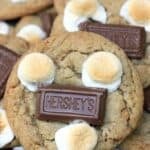 A few weeks ago I posting a recipe for S’Mores Cupcakes but I’ve never heard of S’Mores Cookies OR S’More’s Bars!! I love both these ideas – – and I’m ‘pinning’ this immediately!! Mmm those look like such a delicious treat! It’s funny, I was actually telling my boyfriend the other day I was craving s’mores. It’s a sign… 😉 Thanks for sharing this recipe! I’ll definitely be trying it. Oh my, these look amazing! I love baking over the weekend as well My daughter and I will have to give these a try! I love baking on the weekends too 🙂 Can’t wait til my daughter is old enough to bake with me! Made these over the weekend. They are so good!